by John G. Watkins, Ph.D.
Norton Creek Press, January 2016, 398 pages. Suggested retail price, $39.95. ISBN 978-0-9819284-5-6. 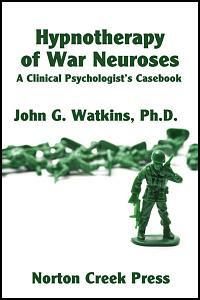 John G. Watkins’ groundbreaking Hypnotherapy of War Neuroses gives a detailed account of the context, methods, and results of his techniques at Welch Convalescent Hospital during World War II. These techniques showed considerable success, more than enough to be worth studying even today. After World War II, Watkins continued his career as a clinical and research psychologist, especially as Professor of Psychology and Director of Clinical Training at the University of Montana. He developed several important clinical techniques, including affect-bridge age regression, still considered by many to be the gold standard of hypnotherapeutic techniques. He also developed ego-state therapy, which applies family therapy techniques to a single individual to resolve inner conflicts. Hypnotherapy of War Neuroses is an important book, still both readable and relevant in spite of the passage of time. Watkins starts with a section on military neuroses, then a section on hypnotherapy in general, then a series of individual case studies. Watkins uses a straightforward approach to his material. This makes it far more than a “history of hypnosis” work, but a treasure trove of techniques presented in context to solve a range of problems that are sadly still very much with us today. When reading this book, I was struck by Watkins’ frequent changes of direction in session. Much of modern hypnosis is heavily scripted to the point where the hypnotist loses flexibility. Watkins was willing to switch gears abruptly in pursuit of his goals, often without transition, using the hypnotic subject’s willingness to follow where the hypnotist leads, whether the sequence makes sense or not. This gave me a new respect for both the unscripted striking while the iron is hot, and of direct suggestion in general. Other readers will no doubt take away different, equally useful lessons. In short, hypnotherapy has both gained and lost ground over the years, as new techniques are added but old ones, some very valuable, fade away. Sometimes the old techniques are lost, but sometimes they are preserved in a clear and practical book like Hypnotherapy of War Neuroses. Out of print for decades, Norton Creek Press is proud to make Hypnotherapy of War Neuroses available to a new generation of therapists. 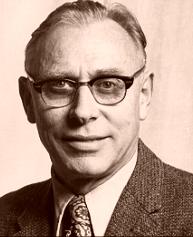 John Goodrich Watkins was Professor of Psychology and Director of Clinical Training at the University of Montana from 1964 to 1984. He was also the author of over 190 academic articles and 11 books, including General Psychology (1960), The Therapeutic Self (1977), Hypnotherapeutic Techniques (1987), Ego States: Theory and Therapy (1997), and a fascinating book of short stories named Adventures in Human Understanding (2001). Born March 17, 1913 in Salmon, Idaho to parents who were both educators and teachers, young “Jack” was fascinated by academics from an early age. His first interest was astronomy, and as a fourteen-year-old he made regular contributions to the Association of Variable Star Observers of which he was the youngest member. After giving a presentation to Astronomy classes at the College of Idaho, he was written up in the local newspaper as a “boy wonder.” Harvard University lent him a large telescope to assist in his research. After receiving BS and MS degrees from the University of Idaho, Jack taught high school and was responsible for seven subjects, including music, science, math, band, and glee club. “In those days if you had a college degree it was assumed you knew everything, so I could get away with it as long as I stayed one chapter ahead of my students,” he once remembered. He eventually earned his PhD at Columbia University. Combining psychology with a lifelong passion for music (in particular, Dixieland jazz), his dissertation became the Watkins-Farnum standardized achievement test, which was published and is still widely used by bandleaders for evaluating musical proficiency and determining chair position. After getting his PhD, he worked as an assistant professor at Ithaca College in New York, and 2 years later as a professor at Auburn University in Alabama. When America entered WW II in 1941, Jack felt the general patriotism and wanted to serve his country. He first applied to the Navy but failed the eye exam, so the next day he enlisted as a Buck Private in the army. After basic training, his educational background became known and he was promoted to Lieutenant, then given the position of chief psychologist at the Welch Convalescent military hospital in Daytona Beach, Florida. Three years later when the war ended, he was discharged as a First Lieutenant with an award for Meritorious Service. He then taught at Washington State College as an associate professor, was chief psychologist at the VA Hospitals in Chicago and Portland Oregon, eventually coming to Missoula as a full professor. Academically he is best known for his work in the areas of hypnosis, dissociation, and multiple personalities. With his wife, Helen Watkins, he developed ego-state therapy, which uses hypnosis to analyze underlying personalities rather than traditional talk therapy to find the causes of psychological problems. The most famous example of the use of ego-state therapy was the interrogation of the Hillside Strangler, in which he solicited a confession by revealing the killer’s multiple personalities. In addition to psychology, Dr. Watkins also loved music. In the 1930’s he played upright bass in various dance bands. He had a rare euphonium baritone which he played in Missoula’s Town and Gown Dixieland band, and later on learned to play the vibraphone at age 80. Dr. Watkins was 98 years old when he died while taking a nap Thursday morning, Jan 12, 2013. He is survived by his children John Dean, Jonette Alison, Richard Douglas, Gregory Keith, Rodney Phillip, and ten grandchildren. —From the obituary of John G. Watkins. See a fun paper Watkins presented in 2009, Hypnosis: Seventy years of amazement, and still don’t know what it is!